1000 years ago, at the end of the 10th or early 11th century, a well fortified frontier fortress emerged on the northern edge of the Volga Boulgaria. 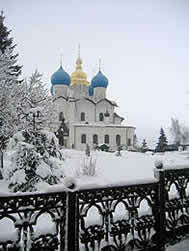 It was built on a high cape on the left bank of the Kazanka River, near its confluence to the Volga. Its task was to control merchant vessels sailing along the Volga, ensure safety of foreign merchants arriving from towns of the Baltic region, North-West Rus, and other lands to the famous Boulgar fairs. One of such fairs was located at the estuary of the Bulak channel coming very close to the western walls of the Kazan fortress. Owing to its extremely favourable location on the Great Volga Route, which was a northern branch of the Great Silk Road, the original fortress was rapidly gaining features of a town. The trading quarters appeared along the walls of the fortress, as well as town necropolises, mosques, and administrative buildings; also developing was the brick and stone architecture. 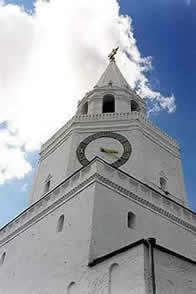 The town was destined to become a large economic, political, and cultural centre of the vast Volga-Ural region. It has become the capital of the Kazan principality as early as already at the time of the Golden Horde, not later than in the second half of the 14th century After the assassination of the local Boulgar prince, Alimbek, and seizure of power by young khan Mahmoud, son of Ulug-Moukhammad, in 1445, Kazan became the capital of the khanate of the same name. It continued to play the role of a large administrative and political centre of the region even after 1552, having preserved this official status until 1920 when, at last, the Tatar people regained their sovereignty, and Kazan became the capital of the Autonomous Tatar Republic. It played (and is still playing) a crucial role in the centuries-old fates of the Tatar, Russian, Mari, Chuvash, and many other peoples of Eurasia. The thousand-year-old history of Kazan is rich in events, some dramatic, some tragic. Many times it was destroyed, burned and revived anew. We know but little so far about its early history. The original Boulgar-Tatar written documents practically did not survive. The Russian chronicles, notes by travelers, memoirs of contemporaries, and legends of the Volga Tatars do contain interesting information, but they are few, fragmentary, subjective, and often intentionally misrepresent historic facts and events. The early works on the history of Kazan published in the 17th-19th centuries highlighted very different aspects of Kazan's past. The authors of those works were the first to raise the question about the age of the city for scientists. The interest was caused by natural curiosity intrinsic to any human being: when did the town emerge? Who founded it and what was it like at the time of its childhood? Relying practically on the same sources, historians gave equivocal answers to these questions, because, sometimes, they had directly opposed goals. However, the main thing in their works was that the town on the Volga was considered not simply as an economic and political, but also as a spiritual centre of the Tatar people, the entire Moslem world of Russia, as a kind of a symbol uniting the Turkic peoples. 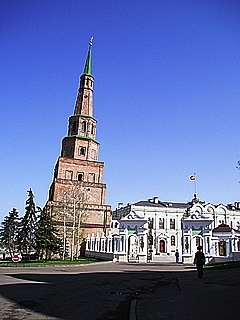 In the second half of the 20th century the study of Kazan's past was enriched by archaeological finds collected in the course of excavations done by Nikolay Kalinin (1888-1959) and Alfred Khalikov (1929-1994) in the territory of the Kremlin and beyond its walls, in the historic part of the city. As a result, it became possible to settle many disputable issues and eliminate mistakes in highlighting the key periods in life of the centuries-old city. Unfortunately, the large-scale and targeted research activity was out of question at that time. But even the single digs on small areas presented the scientists with sensational finds (white stone walls of the fortress of the 12th century, remains of khans' mausoleums, etc.). Unfortunately, for a number of reasons, these finds were not properly estimated and were practically unknown to general public. The invaluable scientific baggage accumulated by previous generations of scientists opened to the present-day historians and archaeologists the vast horizons for a full-fledged and integrated study of the centuries-old biography of Kazan, full of blind spots. For ten field seasons, starting from 1994, when the Decree of the President of the Republic of Tatarstan, Mintimer Shaimiev, has established the «Kazan Kremlin» State Museum-Reserve of History, Architecture, and Arts the archaeologists have started some 60 digs, their major part, of course, being in the territory of the Kremlin itself, but some of them also in the other parts of the city. Their total area at the present moment is over 15,000 sq. m. These excavations gave first-class material, which provided the basis for our contemporary vision of the remote past of our thousand-years-old capital.